Arts and cultural events at UMass Lowell. Film screening – Thursday, Sept. 3, 5:30 p.m. Curator’s talk and reception – Tuesday, Sept. 15, 5:30 p.m. Exhibit runs through Friday, Oct. 16. 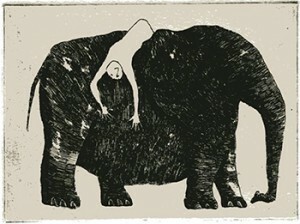 “E is for Elephant,” an exhibition of prints by world-renowned artist and writer Edward Gorey, will be on display and will accompany a screening of a documentary about his life. Gorey – whose animation for the opening credits of PBS’ “Mystery!” series introduced his work to millions of television viewers – illustrated his books and those of authors such as Virginia Woolf, Samuel Beckett and John Updike in a sometimes macabre yet playful style. The exhibit includes a sampling of Gorey’s etchings, original plates, memorabilia and other objects curated by Art Prof. James Edwards of UMass Dartmouth, who will discuss the collection before a reception highlighting the show. The film will be shown as part of September’s Downtown Lowell First Thursdays event, which encourages the public to explore the city’s cultural programs, attractions, shops and restaurants. The film screening, exhibit and curator’s talk at UMass Lowell are all free and open to the public. Film screening – Comley-Lane Theatre, Mahoney Hall, South Campus, 870 Broadway St., Lowell. Curator’s talk – O’Leary Library Learning Commons, Room 222, South Campus, 61 Wilder St., Lowell. Reception and exhibit – University Gallery, Mahoney Hall, South Campus, 870 Broadway St., Lowell. Ribbon cutting ceremony with the Chancellor of UMass Lowell Thursday, October 8, 3pm. Allen House, UMass Lowell South Campus, 61 Wilder Street, Lowell, MA 01854. Free and open to the public.